Rachel Gootchey nurses her 10-month-old son Jasper. She also breast-fed her first child without complications. Rachel Gootchey nurses her 10-month-old son Jasper, and she also nursed her first child. Gootchey was raised by a mom who breastfed, so it seemed like the most natural thing for her to do with her own children. “And honestly, one of the biggest deciding factors was it’s just cheaper. It’s free," Gootchey says with a laugh. "I'm a cheapskate, so I breastfeed." Gootchey is passionate about breastfeeding. 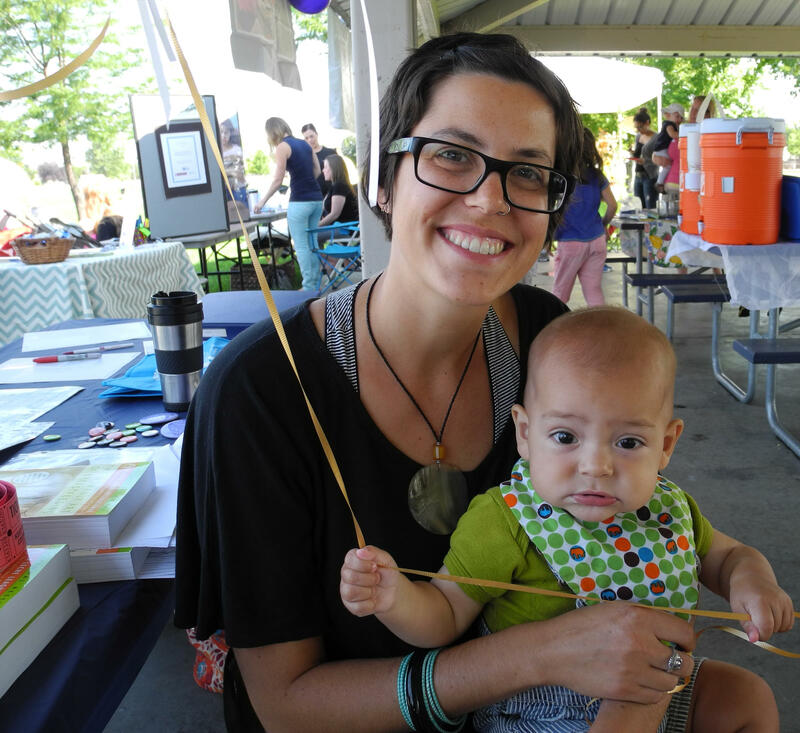 She's a La Leche League leader in Boise, which is a global support group for breastfeeding moms. 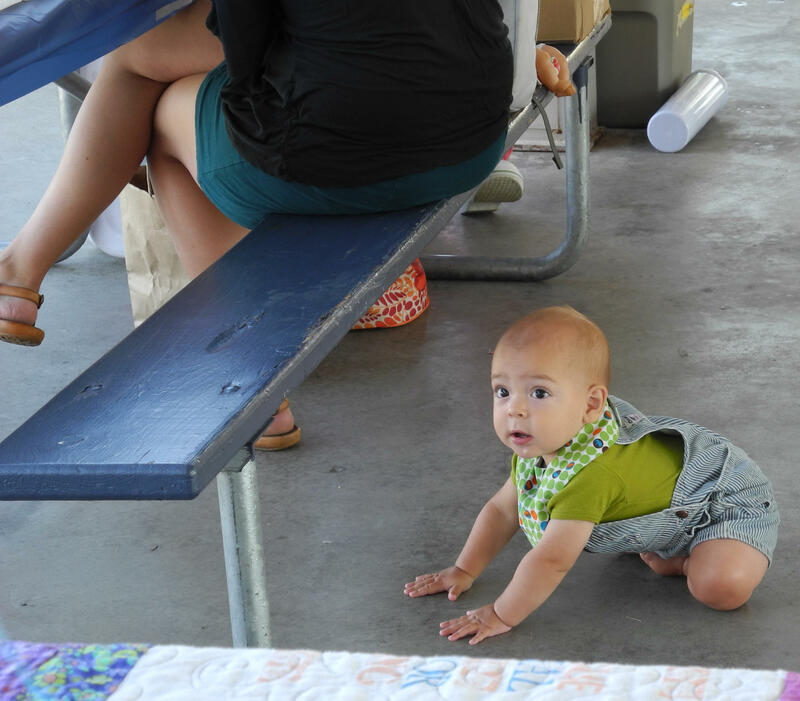 During the La Leche League of Treasure Valley's annual picnic, Gootchey stood on top of a picnic table bench breastfeeding her son Jasper, and leading the group of about 40 women in the "big latch-on." The big latch-on is just what it sounds like. During a designated time, groups of women around the world nursed their babies for one minute. A counter kept track of all the Boise-area moms who successfully "latched." 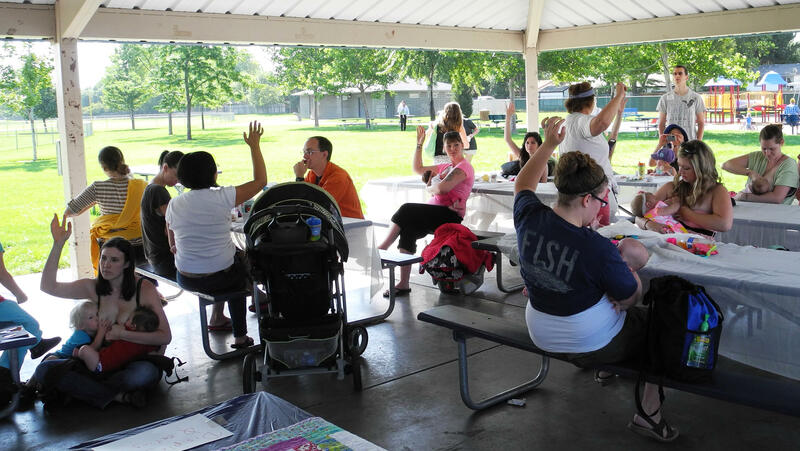 About 40 women joined the La Leche League of Treasure Valley's annual "latch-on" picnic this year. Turnout at the latch-on picnic was bigger than last year's event. And so is the number of Idaho women who choose to breastfeed. The Centers for Disease Control 2013 breastfeeding report card finds 91.8 percent of Idaho women breastfeed for at least some stretch of time. The national average is 76 percent. Breastfeeding rates tend to go down as babies grow. But in Idaho, 45 percent of moms are still nursing once the baby turns one. The national average is 27 percent. Many western states, including Idaho are known for being do-it-yourself places. The states with the highest rates of breastfeeding are in the West and New England. Click around on this interactive map to see where the largest concentrations of breastfeeding moms live. Centers for Disease Control research fellow Jessica Allen says race is another contributing factor to breastfeeding rates. A CDC report released earlier this year found Hispanics are more likely to nurse their babies than whites or blacks. Allen says depending on where you live, how you were raised, or what color your skin is, could make a difference in the kinds of barriers that are in the way of breastfeeding. Allen says it’s also about hospital policies, which vary greatly from place to place. Take the moment when a baby is born. The CDC recommends that newborns be placed on their mother’s bare chest right after birth -- within the first hour. In New Hampshire, 90 percent of hospitals implement skin-to-skin contact. In Idaho, it’s 55 percent. In Mississippi, the state with the lowest breastfeeding rates, it’s 27 percent. After his morning snack, Jasper was ready to roll...or, crawl. Many Idaho moms at the La Leche League picnic said breastfeeding is most successful when there’s a supportive community around them. The American Academy of Pediatrics recommends women nurse for at least one year, and continue for as long as it's the right thing for mom and baby. Rachel Gootchey says Idaho moms just fit the breastfeeding mold.